Codeine testing timelines help to determine how long this drug stays in your system. 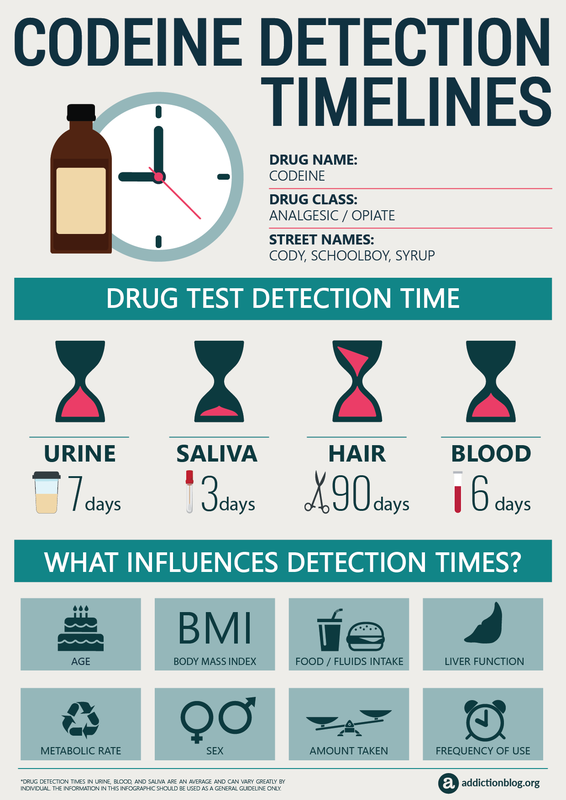 Check out this infographic to find out the detection times of Codeine on various different drug tests. ARTICLE OVERVIEW: Employers, doctors, and courts usually order drug test for codeine using blood, urine, hair, and saliva samples. Each of these tests has a different detection window. Learn more about the timelines for detection here. Then, we invite your questions at the end. Codeine is a prescription medication used for the moderation of pain. Knowing how long this drug stays in your system will help you understand the importance of sticking to the exact dose recommendation directed by your doctor. We hope that this information also helps reduces the risk of drug overdose. Codeine is detected in drug abuse screening tests for opiates. Some tests show the presence of codeine in the system for 12 hours while others detect Codeine even up to 3 (three) months in your system. But why do people get drug tested in the first place? If you have been taking a codeine under a doctor’s prescription, you may be subject to a therapeutic drug screen. Others may need clearence before employment. Still others may be court ordered for legal reasons. How long does Codeine stay in your system? The half-life of codeine is about 3 hours, meaning that half of the drug is eliminated from your body usually 3 hours after you take codeine. Most likely, codeine is detectable by drug testing for only a couple of days after last use. In general, urine and hair tests are most effective at detecting codeine. Codeine detection windows by drug test follow. 1. Urine. Urine tests are most commonly used when employers want to determine if someone has been abusing drugs. Urine drug test screenings are quick and convenient. Even after the effects of codeine have worn off, urine is still capable of detecting its presence. For most standard urine screens codeine will be detectable for 2 – 7 days. 2. Hair. Codeine can be detected in hair for up to 90 days after your last use. Hair drug tests are often times used for determining drug use over a longer time. By analyzing hair, doctors can determine the presence of drug use for months after the last dose. This is so because hair growth is slow. Also know that a hair sample can be taken from anywhere on your body. It takes only 1.5 inches hair length to do the test. Longer hair means longer drug detection timeline. 3. Saliva. Although saliva is not that as popular as other drug testing methods, it is effective for measuring short term drug presence in your system (few days). Saliva tests can detect codeine for 3 days after your last use. Saliva tests actually measure the parent compound of the drug you took. The higher the level of the compound, the more drugs are in your system. 4. Blood. Blood tests are the most effective way to detect concentration levels of drugs in the body. Blood drug tests may be used in an employment setting to detect if drugs are in the employee’s system. Codeine can be found in the blood for 2 – 6 days after the last use. NOTE: Drug detection times in urine, blood, and saliva are an average and may show different results among individuals, therefore the information presented in this infographic should be used as a general guideline only. Opiate drug testing is a subject that raises a lot of anxiety. While we have provided you some basicinformation, some of you may still have some additional questions to ask. Feel free to post all your questions in the section below and we will make sure to try to answer you as soon as we can. And, if you like to learn more about drug testing and detection timelines, download our free guide here.